New research has shown that up to 10 million dust mites live and feed in just one bed! 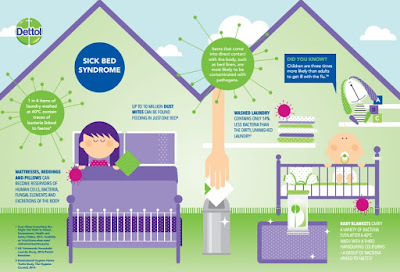 Items such as your bed linen, that come into contact with your body, are most likely to be contaminated with pathogens. After just sleeping in your bed for one night, your sheets can accumulate an array of dead skin, fungus, bacteria, mites and, believe it or not, even faeces! Many of us love snuggling into bed after a long day but what is joining us in bed might not sit so comfortably. Mattresses, pillows and bedding can become reservoirs of the aforementioned fungus, bacteria and human cells and these reservoirs are the ideal conditions for dust mites. Whilst dust mites are harmless, their faeces and body fragments can cause allergic reactions which prompt our bodies to release histamines to attack the allergen. This can cause eczema and hay fever and estimates suggest that dust mites may be a factor is up to 80% of asthmatics. 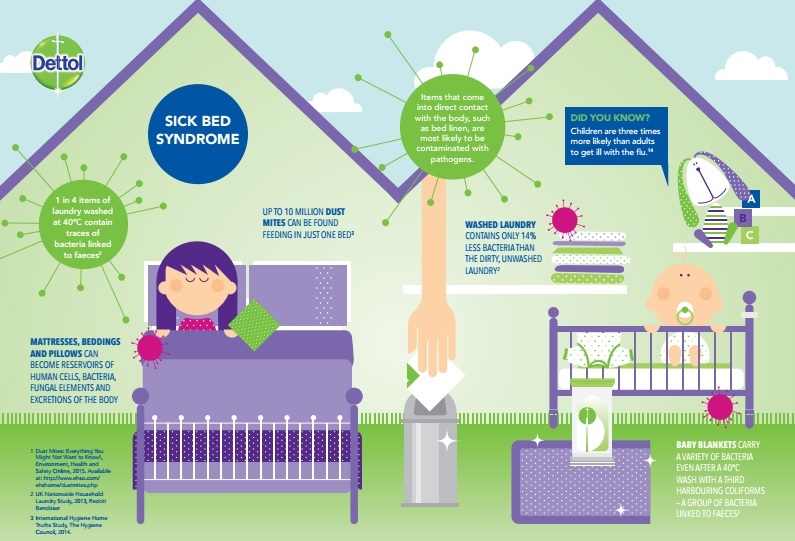 The ultimate breeding ground is the mattress but bed linen required attention too as it can be contained with pathogens which causes the cold, flu and diarrhoea. Bedding, therefore, should be washed on a regular basis using an antibacterial laundry cleanser according to Home Hygiene Expert, Dr Lisa Ackerley. "Just because it looks and smells clean, doesn't mean it's hygienically clean. People have this notion that simple putting dirty items into a washing machine will kill all germs, but that's just not the case. Contagious bacteria and viruses such as Influenza and E.coli can survive low temperature washing, increasing the potential risk of infectionkr your family. For laundry washed at low temperatures, a disinfectant proven to kill 99.9% of bacteria in temperatures as low as 15°C will get it hygienically clean." Our bed is where we spend a third of our daily routine so it is vital that we keep it hygienically clean. A few simple hygiene habits can help prevent the spread of harmful bacteria, providing added protection while we sleep. Change and launder bed linen on a weekly basis and wash separately from other clothing to kill bacteria and dust mites. When washing bed linen, add a laundry disinfectant such as Dettol Anti-bacterial Laundry Cleanser, an additive proven to kill 99.9% of bacteria. Decrease the temperature and humidity levels in your bedroom to reduce the number of dust mites. Regularly vacuum all soft furnishings, including your mattress, within the bedroom. 1 comment on "Is Your Bed Making You Ill?" This is good to know. thanks for sharing. I certainly don't wash bed linen once a week. might have to start.